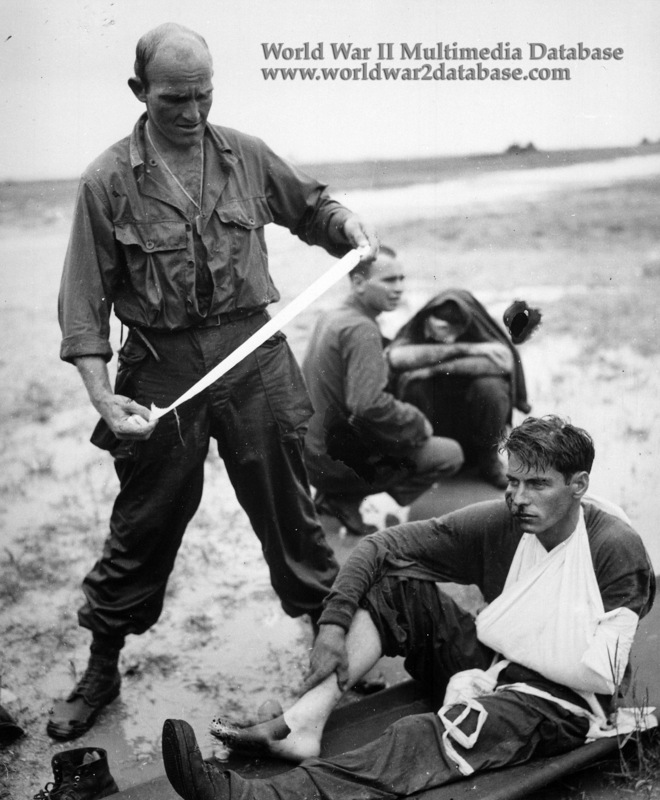 Wounded tankers of Sixth Army, X Corps, 1st Cavalry Division, 2nd Brigade, 7th Calvary Regiment, 1st Squadron, receive first aid from a corpsman after their M4 Sherman medium tank hit a mine at the edge of Tacloban Air Field. Landing at the northern end of White Beach at 1000 Hours, 1st Squadron raced across the Cataisian Peninsula to seize the airfield, accomplishing their mission at 1600 Hours, advancing less than 2 miles (3 kilometers) from the beachhead. Engineers landed behind 1st Cavalry to immediately begin work on the airfield.